Company analysis can be made in the Free Equity Analysis Model, the Equity and Rating Analysis Model, and the Corporate Model. The 3 models are compatible. That is, an analysis created in any of these Models can also be used in/shared with the two other models. The 3 models only differ in which input possibilities they have access to. The Commodity Exposure Model makes it easier to analyze and manage commodity exposures. The Currency Flow Exposure Model makes it easier to analyze and manage currency flow exposures. 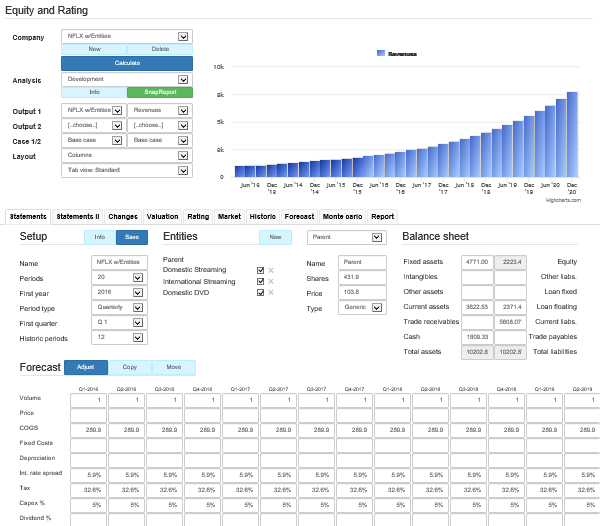 The Loan Portfolio Model makes it easier to analyze and manage the interest rate risk from loans. The Portfolio Model makes it easier to measure and manage your financial portfolio's potential returns. The Long-term Savings Model makes it easier to find a savings strategy that is consistent with your future spending goals. The Free Equity Analysis Model is a valuation model that makes it easy to create a simplified valuation model of a company. It allows to include risk assumptions which enable showing the range of possible outcomes with fan charts and distribution charts. Analysis are compatible and shareable with the other Company analysis models. The Equity Analysis Model Premium makes it easy to create a valuation model of a company. The Equity and Rating Analysis Model makes it easy to create a thorough valuation and/or credit analysis model of a company. The Corporate Model makes it easy to perform both simple and advanced Financial Strategic Analysis in a very short time. The Complete Tool for Corporate Financial Planning and Risk Management. It allows to include both commodity hedges and currency hedges. The Curency Flow Exposure Model makes it easier to analyze and manage currency exposures arising from revenues and costs in foreign currencies. It allows to include derivatives and measure the effect of derivatives/hedging. The Loan Portfolio Model makes it easier to analyze and manage a loan portfolio. It allows to include interest rate derivatives and measure the effect of derivatives/hedging. One version without currencies, and a version that allows to include currencies. In the currency version it is possible to include loans in different currencies and currency derivatives. The Portfolio Model helps you understand and manage the possible future returns on your stock portfolio. Free and premium version. The premium version of the Portfolio Model allows to include more shares, currencies and derivatives.